Hey everyone! This is Meghan from Fox and Briar. I’m stopping by Take Two Tapas today to share this Beer Cheese Dip Tear Apart Bread Bowl with you! We all know that Jennifer is the queen of dips – she is always coming up with creative ideas like this Crock Pot Lasagna Dip or this Sweet Potato Souffle Dip. 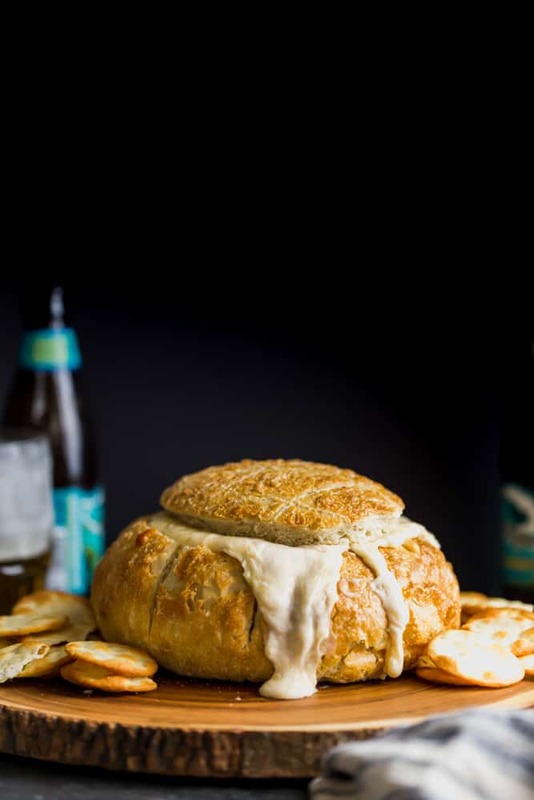 So I knew you readers would LOVE this Beer Cheese Dip in a baked, tear apart bread bowl. Just look at the ooey, gooey cheese . This beer cheese dip is the same dip I used with my Soft Beer Pretzels – I just doubled it because MORE DIP is always a good thing. And I wanted enough dip to fill the bread bowl. I mean, what is better than a cheesy bread dip? 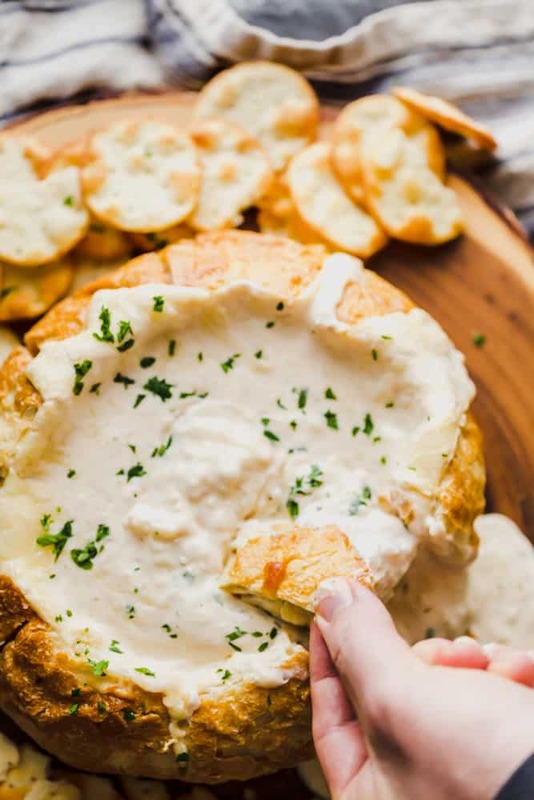 Just take me to the Creamy Beer Cheese Dip Tear Apart Bread Bowl Recipe Already! 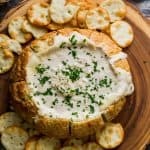 If you’d rather skip my (very helpful, I think) tips and tricks, essential cooking info, and similar recipe ideas – and get straight to this delicious easy Creamy Beer Cheese Dip Tear Apart Bread Bowl recipe – simply scroll to the bottom of the page where you can find the printable recipe card. This Beer Cheese Dip is fun because the bread is sliced to make it easy to tear and dip. You could also serve it with additional slices of bread and crackers for more dippabilities. 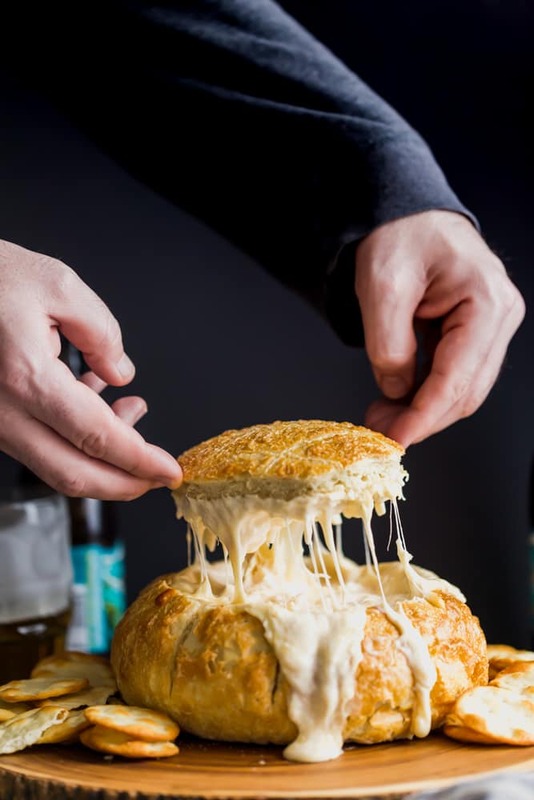 One thing to note is that the Beer Cheese Dip Tear Apart Bread Bowl is like a delicious cheese volcano, so when people start tearing away at the sides of the bread bowl it WILL start to spill over. How exciting is this for a bread bowl appetizer!?!?! I suggest serving it in something with edges to catch the cheesy dip. OR just have people dip other slices of bread into the bowl and don’t start tearing away the sides until most of the dip is gone (which won’t take long – this Beer Cheese Dip will disappear before your eyes!). Make this cheesy dip for game day, New Year’s Eve, or anytime you want to serve a fun party appetizer. And I hope you all have a Happy New Year! 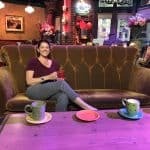 Thanks to Jennifer for letting me visit her blog today! Q: Can you make it ahead of time? A: I wouldn’t recommend it. The cheese dip will separate! Q: Can I use other cheeses besides Mozzarella and cheddar? A: You can use whatever cheese you like! 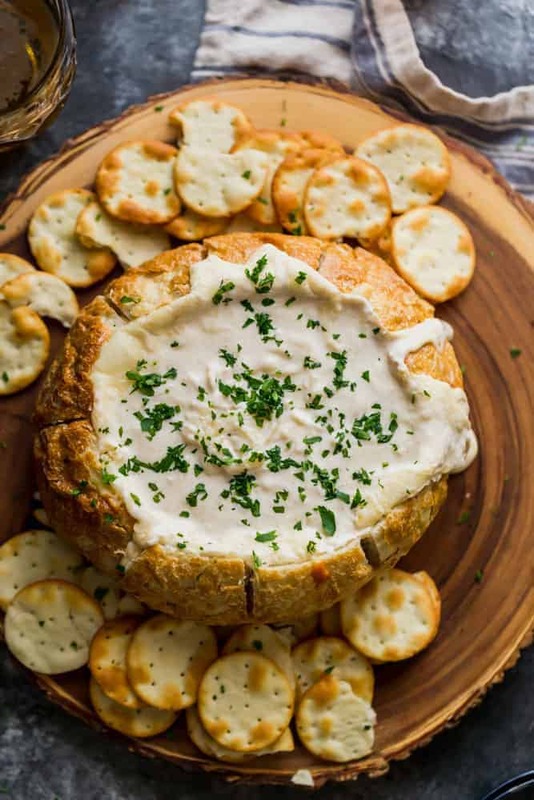 Other great Beer Cheese Bread Dip recipes to try! 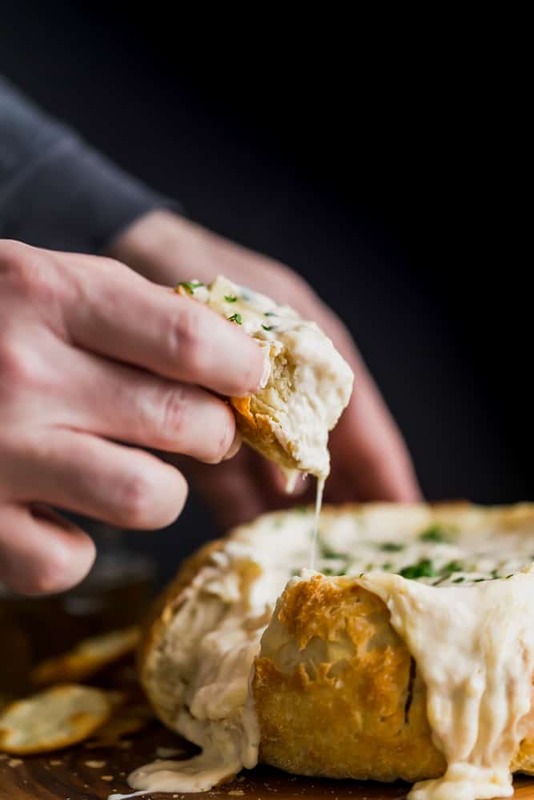 If you love this Beer Cheese Dip Tear Apart Bread Bowl Recipe as much as I do, please write a five-star review in the comment section below (or on Pinterest with the “tried it” button – you can now add pictures into reviews, too! ), and be sure to help me share on facebook! This cheesy, creamy Beer Cheese Dip Tear Apart Bread Bowl is a crowd pleasing appetizer that your guests will love! Cut a circle in the top of the bread leaving about 1 inch around the edge. Remove the top and tear out the inside of the bread to make room for the dip, leaving about 1-inch wall around the middle and bottom. Cut slices around the edge of the bread about 1.5 inches apart. Slice about 3/4 of the way, but not all the way through the bottom. This will make pull apart pieces for people to tear off and dip. In a medium bowl, stir cream cheese until smooth. Add the grated cheddar cheese and 1 cup of the grated mozzarella, stir to combine. Add the garlic powder, beer and hot sauce, stir until completely mixed. Pour into the prepared bread bowl and sprinkle the remaining ¼ cup of mozzarella on top. Replace top of the bread. Bake for 20-25 minutes or until cheese is melted and bread is golden. Garnish with chopped parsley if desired and serve with additional slices of bread and/or crackers for dipping. Serve in a dish with edges to catch any of the cheese dips that might spill out. I’d love to dig into that bowl! We love cheese dips and the bowl presentation is stunning! Oh my gosh this is like the trifecta of deliciousness – beer, cheese, and bread!! I just want to dive in! OMG! This cheesy dip with all its melty goodness looks amazing! I may have to “throw caution to the wind” and give it a try!